Here are some common questions we get asked about our ramps. Please don't hesitate to contact us direct for any further information. Q.How long does delivery take from order? Our WM Light range takes approximately 5 – 10 working days from your order. All other ramps will take between 2 – 4 weeks from order to delivery. This may take longer during our factory shut-down periods in August and late December. Q.What is covered by the warranty? All new WM System ramps come with a 2-Year Warranty as standard. This covers your ramp for any defect in manufacturing, but not for any wear and tear on the ramp. Q.Can I fit the ramp myself? Yes, although most areas in mainland UK are covered by our fitting service and distributors. All our ramps come with full fitting kit and instructions specific to your vehicle. So long as the instructions are followed correctly, this will not affect your warranty. Depending on the vehicle and ramp, fitting normally takes between 2 and 4 hours. Q.Can I remove my ramp and re-fit on to a different vehicle? Yes, but it does depend on the size of ramp and the size of the doors on the new vehicle. You may also need a fitting converting kit specific to the new vehicle. 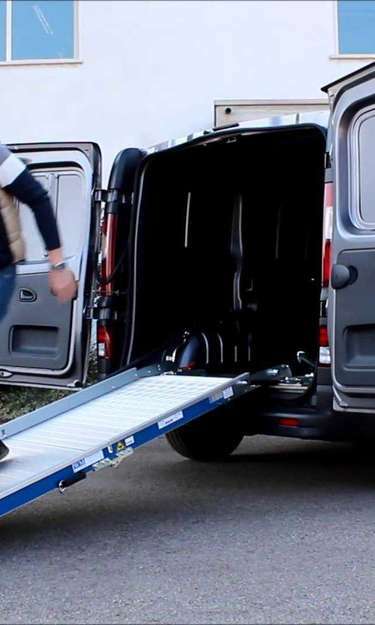 A second fitting kit is also available if you would need to use the ramp in more than one vehicle. Q.Where is your price list? At the moment we offer over 800 options of ramps and models in our range. We feel that it is vital to understand what our customers are loading, and on to which vehicle, to give more personalised options to suit your needs. Our distributors are also available for pricing, should you need a fitted quote local to you. Q.Do you offer spare parts and repairs service? Yes, we have a full parts list and diagram for every ramp model. We just need to know the ramp model, serial number and the vehicle it's fitted on to. We also offer repairs, service and technical advice for all our valued customers.